Are you wondering how to make a small half bathroom look bigger? If your half bathroom is on the smaller end, there are a few different ways to help your bathroom feel larger than it is. Designers advise installing glass door panels, using big mirrors, and using light colors for the tiles and walls. The point here is to free up as much floor space as possible. A wall mounted toilet can be fixed just at the right height for you, making it easier to clean the floors. The plumbing, the working parts, and the tank are all fitted behind the wall. Light colors not only warm up a room, but they also help to make it look and feel airy. The reflective nature of white makes it a color you should consider. Any other light color schemes could work, but the shades should all be complimentary between the tiles, the floors, walls and vanity. A large mirror can help add extra depth to the room. You could also place two mirrors side-by-side instead of the large one, so it mimics a double vanity. The reflection adds extra perceptive depth to the room. Nothing adds extra space to a room more than extra lighting. You can also go natural with big translucent windows that let in the daylight while still securing your privacy. One or two murals on the walls will help to distract the mind and take away attention from the small limited size of the room. The best wall art to go for typically is paintings of an outdoor landscape. The other reliable way to enlarge your small half bathroom is to declutter. Remove all unnecessary items and clean the bathroom. Your mind will feel at peace in a clean room, and suddenly size will cease to matter. High ceilings feel spacious, and you can achieve that just with creative decorations. Paint the ceiling with vertical stripes or lattice along the edges. Ceiling decor needs to be uniform and in sync with the rest of the room’s color scheme. 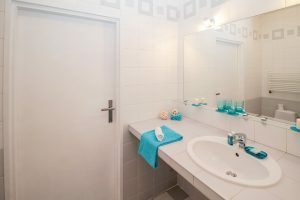 Do you know how to make a small half bathroom look bigger? Some of best ways to make a space feel bigger is by using light colors, adding mirrors, and letting in plenty of natural light. Different Types of Closets – What are the Differences?